Tomatoes, tomatoes everywhere. The tomato plants are heavily laden with tomatoes–many still green. When I wake up in the mornings I’m starting to feel a slight chill in the air. It won’t be long until there is frost. It’s time to make Green Tomato Mincemeat. 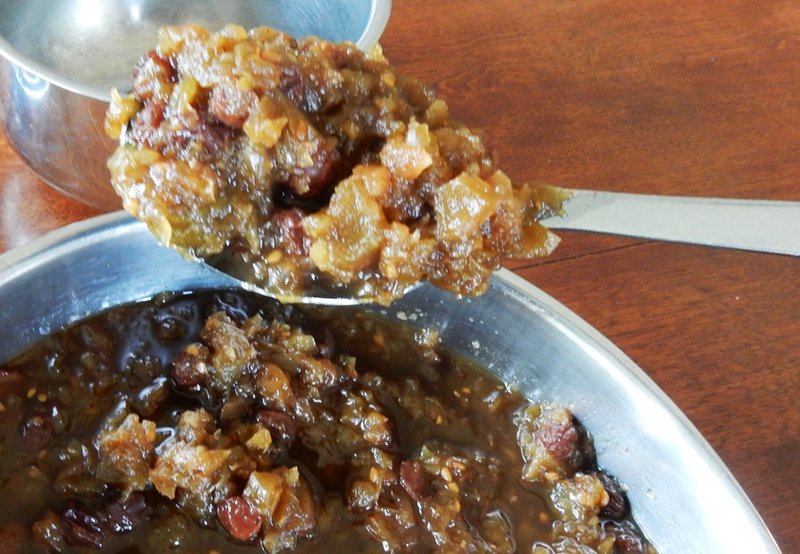 This traditional “mock” mincemeat has been made by frugal cooks for countless years. And, no wonder–it tastes as good, if not better, than real mincemeat and make the perfect mincemeat pie. 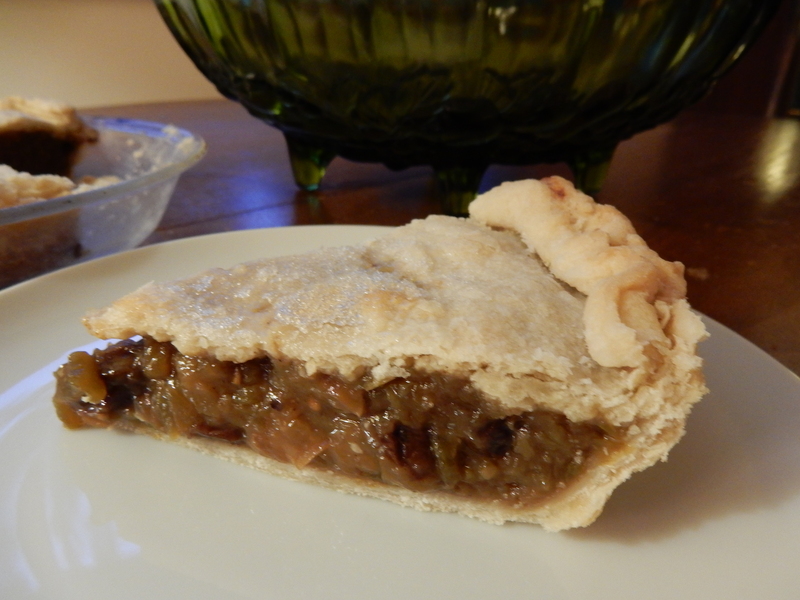 For my husband and me, Green Tomato Mincemeat Pie is an Autumn comfort food. We remember our mothers’ and grandmothers’ (and the church ladies) making this scrumptious pleasantly sweet, yet tart, traditional pie with its tangy blend of spices. Core and quarter tomatoes and apples; put through food processor or chopper. Combine all ingredients in large saucepan. Simmer 2 hours, stirring occasionally. May be canned or frozen. Amount: This recipe makes enough mincemeat for 2 9-inch pies. Preheat oven to 425 degrees. Stir the flour into the mincemeat; place in pastry-lined pie pan. Cover with top crust. Seal and crimp. Cut slits in top crust (or poke top crust several times with a fork). If desired, brush with a small amount of milk; sprinkle with sugar. Bake in oven for 10 minutes; then reduce heat to 350 degrees. Bake an additional 20 to 30 minutes or until crust is browned and juice just begins to bubble through slits in crust. Posted on September 14, 2015 September 13, 2015 by SherylPosted in Food, recipesTagged apples, desserts, green tomatoes, pie. Next Next post: Is Your Cooking in a Rut? This is very interesting! We always call Mincemeat pie is really Raisin Pie in our NEPA town. Interesting. . . . There are a lot of different ways to make mincemeat; though I think that that raisins are generally one of the ingredients. It sounds like they are the main ingredient in the area where you live. This sounds wonderful. For years, I bought canned mincement from the Vermont Country Store, since it was only a Christmas treat, and I was the only one who liked it. It wasn’t a true “meat” mince, but something very much like this. I never spent any time trying to run down a recipe, but now that they aren’t carrying the product any more, I believe I’ll give this a try. I’m not so fond of what comes in the small, square boxes that has to be rehydrated. This sounds much better! I think that you’d like it. It has a really nice flavor. There are a lot of different recipes for mincemeat. The very traditional ones actually contain meat–but today many mincemeat recipes don’t call for any meat. Some have apples, raisins, and spices; and, of course green tomato mincemeat also contains tomatoes. If you like green tomato pie, I think that you’ll love this recipe. I’ve made green tomato pie occasionally using just the tomatoes, cinnamon, flour, and sugar. It’s nice, but I like this one better. Yes, what you describe is the kind of pie I’m used to making, but this version does sound better. I’ll give it a try next time. I’ve never tasted mincemeat, and have just become a fan of fried green tomatoes (although I grew up in the South!). This dish sounds very “autumnal”! I’ve noticed that in recent years to even farmers’ markets sell green tomatoes. I think that they are becoming more popular. Sounds so much better than the Christmas traditional pie! I have always made mincemeat cookies and mincement pies from box mincemeat (Non Such?) that had to be rehydrated but that is harder and harder to find. Might have to try this. I think that you’d like this recipe. I find it soooo frustrating when stores discontinue an item that I regularly purchase. It’s nice to hear that you liked the photo. I’ve been practicing my photo-taking skills, but my pictures still sometimes seem a bit hit or miss. This looks really interesting. I find that I crave more vinegary foods as I get older, and this is one I definitely will try! I’ve never tasted a mincemeat pie. I even thought it was a meat, real meat pie. You have opened two new pie avenues. I’ll taste mincemeat and I’ll learn to make a pie crust. I know if I can get crust making down, the sky is the limit on how many pies I can make. I found out that cakes are out and pies are IN!! Oh dear, I was planning to make a cake when I have friends over the next time. It’s good to know that they are out of style. 🙂 Then again, I may just make it anyway, since I’m not one to follow fads. It’s a little confusing but real mincemeat is actually made out of meat; however, “mock mincemeats” have been popular for a very long time and many mincemeat recipes do not call for meat. A friend gave me some of her home made green tomato mincemeat. I have used it in an apple cobbler type dessert. It’s delicious stuff, and your pie looks superb. What I good idea! I never thought about using mincemeat in a cobbler-type dessert. I’ll have to try it the next time I make green tomato mincemeat. I have never made mincemeat pie but this looks like it would be worth a try! I think that you’d like it. It is a nice autumn dessert. I’ve made this recipe both ways, and both are good–though I think that I have a slight preference for peeled apples.